Most of the toilets at the Okaukuejo Combined School hostel and school grounds are out of order (file photo). Windhoek — The Ministry of Education, Arts and Culture has confirmed it commenced the procurement process for the renovation and additions of hostels and housing at the Mureti High School in Opuwo. 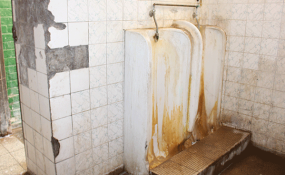 Maintenance and hygiene of some parts of the school are an eyesore, including dirty toilets and some structures that are not well maintained and this has irked residents of Opuwo. The Governor of Kunene Region, Marius Sheya recently stated that the Ministry of Works and Transport was unblocking toilet pipes to make way for learners to clean the toilets. "We should restore confidence in the public service delivery," said the governor. Sheya also said: "In terms of the Mureti High School, I spoke to authorities both at school and regional level. It's very positive engagements we will implement short term activities while we wait for the implementation of the renovation of the whole school as budgeted for in the capital budget, still hopefully this year." The Public Relations Officer of the Ministry of Education, Arts and Culture, Absalom Absalom told New Era that works at the school will be done in two phases. "Phase one involved fencing off the school while the second phase for construction is currently under bidding evaluation," said Absalom. As a result, the ministry cannot at this stage reveal the cost of the project because the tender has not yet been awarded. "However completion of this renovation remains a priority," said Absalom, adding that it would take 12 months for the project to be completed.